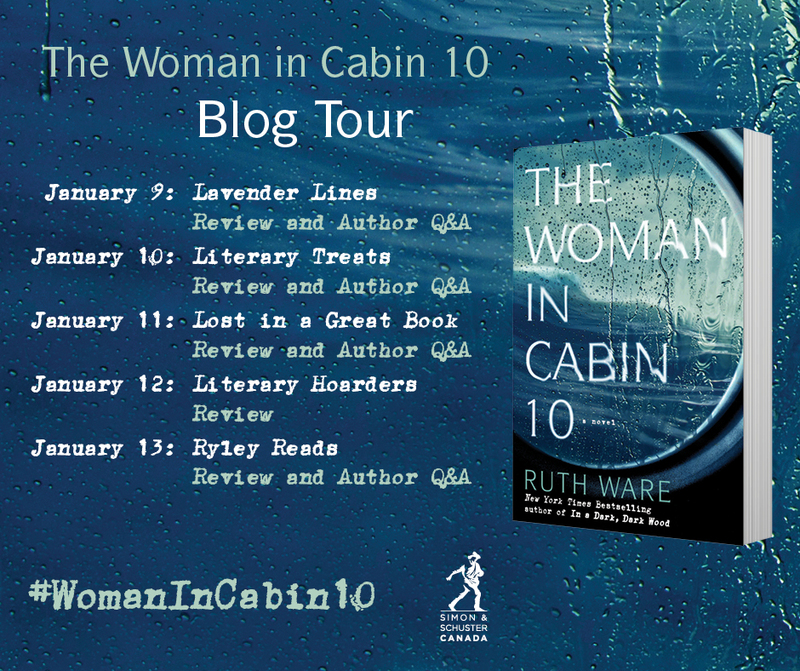 Today I am super excited to be hosting Ruth Ware for her The Woman in Cabin 10 blog tour! My review will be posted below, but first, here’s my Q&A with Ruth. Ruth: Thank you for having me – it’s great to be here! LL: Do you listen to music when you write? R: No! In fact I find it incredibly distracting. I used to be able to write while watching TV, but that was years ago. The older I get, the more intolerant I get to interruptions, and now I find I work best in complete silence. In fact my neighbours have building work going on right now (as in, literally, I can hear hammering while I type this) and even that is annoying me, but music gets into my head in a really infuriating way. I find it drowns out what my characters are trying to say. I’m definitely not a writing in coffee shops type person. R: Definitely coffee! None of my characters are very autobiographical, but that’s the one trait of myself that I put into Nora as a straight cut and paste. I am a coffee addict and find a week without coffee (or even just a week without my preferred type of coffee) really hard work. LL: Who is your favourite mystery writer? R: Oooh, this is hard! I have too many, and it changes all the time. I tend to say Agatha Christie just because I really admire her plots and because I think she’s critically very under-rated. But today I’m going to say… Dorothy L Sayers. Strong Poison is probably the crime mystery that I have read and re-read the most number of times. LL: Your books have the most delicious twists and turns. How do you come up with them? R: I have no idea! Sometimes they are plotted from the outset but more often they just arise naturally as I write. The final page of The Woman in Cabin 10 (people who’ve read it will know the bit I mean) was a complete surprise to me, and I had to go back and re-write quite a few bits to make it work. LL: If you weren’t an author you would be _________(and the skies the limit)? R: Well, I used to work in PR so I guess the prosaic answer is that I would probably still be doing that! Alternatively, I have always really loved numbers (I very nearly did maths at university) and I find accounts and figures very satisfying, so maybe I would retrain and become an accountant? Sorry, I realise those are not very “the sky’s the limit” type answers! LL: Thank you again so much! R: Thanks for having me! Okay, I loved this book. Lately I have been reading some awesome mysteries with unreliable narrators and enough twists and turns to pull a muscle and The Woman in Cabin 10 is one of the coolest. Through most of the book I had no freaking idea what the hell was going on and I often stopped reading to try to puzzle things out. And just when I thought I had it figured out the author threw something else in that made me once again not know what the frig was happening. The timeline was somewhat wonky and that only added to the WTF feeling I had through most of the book. But it wasn’t so wonky that I was so confused I was frustrated. Nope, this was the best kind of puzzle to try to figure out. Most of this book takes place on a ship and I’m also starting to love the whole mystery where no one can leave thing. Ware also did this in In a Dark, Dark Wood and once again it works perfectly for the story. The characters were very believable and I never felt 100% like I had a solid grip on them. Once again, as in all the great mysteries, the good guys and the bad guys weren’t clear at all. This was a well written, well thought out mystery and Ware is fast becoming one of my favourite mystery writers.